Category Archives: Pragmatic Group Activities. I went to the Social Thinking® conference presented by Michelle Garcia Winner, Pamela Crooke & Stephanie Madrigal in Portland. Now I am energized to try new strategies with some of my social pragmatic challenged students. I attended the first 2 days which focused on Lessons and Strategies to Help in the Classroom and Beyond. We were the first conference in the tour and it had to be one of the largest conferences I’ve ever attended with about 500 people. It was so good to see the mix has expanded to counselors, administrators, and general education teachers. Because it was the first session, it was a trial to see how much material could actually be covered. Parts had to be skipped because of time limits but we still covered a wealth of information. I especially appreciated the video clips of sessions from Michelle’s clinic. I also enjoyed seeing the progression of students who were on video clips 5 years back. This conference mentions the Superflex series and a new book in that series but does not dwell on them. I attended a presentation by Michelle about 5 years ago and it is amazing how her program has expanded since then. Her program has become even relevant for our caseloads today. She presented how our goals and objectives can tie in with the state core standards. The handouts are especially helpful when talking to parents and teams. I found it gave me a whole new reference point when determining strategies and actually used it directly the next day when talking to students and teachers. Upon my return, I found myself reshuffling my schedule to make groups for instruction in Social Thinking®. Our school counselor started to use Superflex for whole class instruction but I realized I had a number of students that were not getting what they needed in our large class sizes. I feel this type of instruction will have the most impact for students as they mature. I recommend you go to the conference if you have the chance. It really has been a busy month . I decided I better post before the month is over. Just to give you a heads up, I added another page to record group activities. I am finding my group activities tend to get buried in the blog when I try to refer back to them. I have been using a theme of spiders this month. In our part of the country the spiders really come out of hiding and webs are very noticeable. Children are always fascinated by them. I am working with a younger population and students with more severe disabilities that require a lot of repetition and motor activities to keep them interested. I find if I can use the same theme vocabulary with a little variety in the activity they are more likely to keep interest and retain the vocabulary. It helps to find a theme that has a lot of activities. I discovered there are really a lot of songs, rhymes, and crafts around the topic of spiders. The first project I started was the bulletin board. I got my idea from enchantedlearning.com. They had a craft that used glue, black paper, and glitter to make a spider web. You know how the students and I love glitter. Besides, we have a new janitor and I had to condition her. She was nice enough to take it in stride although she said it may take awhile to get rid of the last sparkles. I really do try to keep the mess down, but my drying box turned out to have a hole in one corner. In the past, my room has had a trail of glitter coming from it down the hall. The spider web craft project was meant for individual webs. However, I decided we could make one large web if we joined them. I like to promote group effort for social pragmatic reasons. 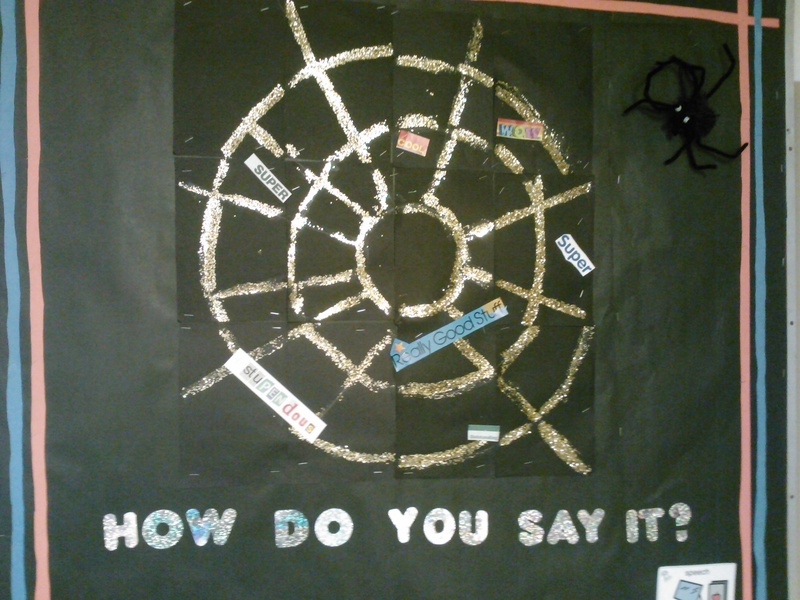 Before doing this project with the students, I tacked black paper up on my bulletin board. 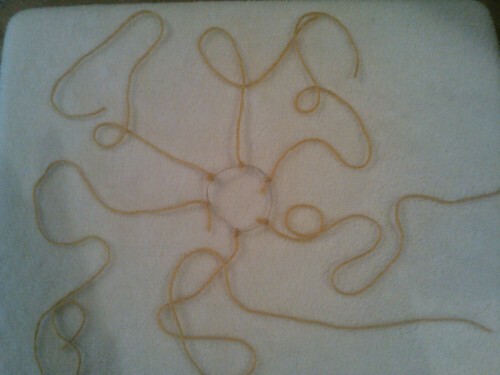 I then used a white crayon and string to draw circles from the center. I then added intersecting lines to make the web. I then took the black rectangles down and cut them into squares for the students to use. The students put glue (white glue or heavy glue stick) on the lines and shook the picture in my glitter can. They always love seeing their creation when it comes out. This gave the opportunity to talk about parts and the whole. Warning! If you have a lot of squares it would be good to number them before taking them off the board. We then tacked the squares back up on the bulletin board to form the web. I decided to extend this project even further for some of my older students. They read Charlotte’s Web for their “Battle of the Books” last Spring. If you remember the spider saved the pig by putting newspaper clippings in her web and spelling out words. I encouraged them to add positive words from newspaper clippings to the web like Charlotte did. It was emphasized that old newspapers and magazines are used and not books. I added a spider made of yarn and pipe cleaners in the corner. The older students also used one of my favorite app programs “Storykit” to sequence the directions and provide the oral commentary. This was used as a visual direction for the younger students. The counselor and I run social pragmatic groups in the two Life skills classrooms. We brought spider activities into those classrooms as well. You may notice I have added a new page, listed above, to keep record of classroom activities for this population. The 1st session with this group involved calling a name of an individual to get attention, using eye contact, and then tossing a small rubber ball to them. This encouraged a number of social pragmatic skills around how to get someone’s attention and make a communication exchange. It also was good preparation for the yarn activity coming up in another session. We had pictures of the kids which we placed under colored paper leaves. We sang the song “ Where is Thumbkin?” and used the kids names. It promoted using names, the colors of the leaves, and asking where questions. In the next week, session 2, we used a ball of yarn instead of a ball for the tossing and kept hold of the yarn with a left hand. The yarn stretched across the center and built a web of sorts. This promoted group participation because everyone needed to remain connected for it to work. We added concept words such as over and under when talking about the yarn. For a 2nd activity we introduced spider songs, “There is a Spider on the Floor” from http://kinderkorner.com/spiders.html. I used a free app called SoundingBrd to build a 2×2 communication board. The board was used by our non verbal students to direct what body part the spider should go when singing the song. This introduced body parts and basic prepositions. For week 3 we used a sheer length of fabric ( I think it was a curtain in a previous life) and placed a beanie baby spider on top. The students grabbed hold of the edges and followed directions of holding it up, down, low, high etc. The spider could be slid down the fabric by holding it up and down on the ends. This introduced some more prepositions; up, down, edge, and end. We sang there is a spider on the floor again and reviewed prepositions again. We put pictures of the students behind leaves. They guessed where individuals were behind the leaves saying a color plus the leaf. For week 4 of this theme we used spider rings from the dollar store. The previous songs were used again. The spider rings were placed in the locations mentioned in the songs. Students were introduced to prepositions such as behind and in front. A new song “Little Miss Muffet” was added. We hid the spider rings behind our backs and then sang up the notes as we crept up from our toes to our head. For the end, we put pictures of the students behind cut outs of pumpkins and they guessed where individuals were. For the older group we discussed near and far. The students tossed bean bags as they got further and further apart. We then used a spider in a game of warmer/colder except we used nearer/further. One child closed his eyes while the spider was hidden. The other students then called out further or nearer to the student until he located the spider. We have conferences coming up so that takes us through the month of October. Bulletin boards, Pragmatic Group Activities. I have begun using the program with several of my students in small groups. So far I am impressed. I have a few students who are on the higher end of the Autism Spectrum and have difficulty with social pragmatics. They are often sensitive to anything that points out imperfections they may have. In the past, I’ve had difficulty getting them to participate in role playing. Their initial reaction is to declare an activity as boring and then not participate. Yep, my Destroyers of Fun. On cue, that is how we started out. The comic nature of the program roped them in and as soon as the props came out they included themselves. The characters are a great feature of this program. They let the students step back and talk about problem behaviors in an unthreatening way. They actually start to recognize what they have in common with the characters. I was amazed how much information they had retained after three sessions and sending the parent letter home. They explained the characters and strategies to a guest therapist on the 3rd session. It appeared they had actually talked about the characters with their parents. I guess we all want to be super heroes deep down, and we all have those unthinkable moments we need to conquer. 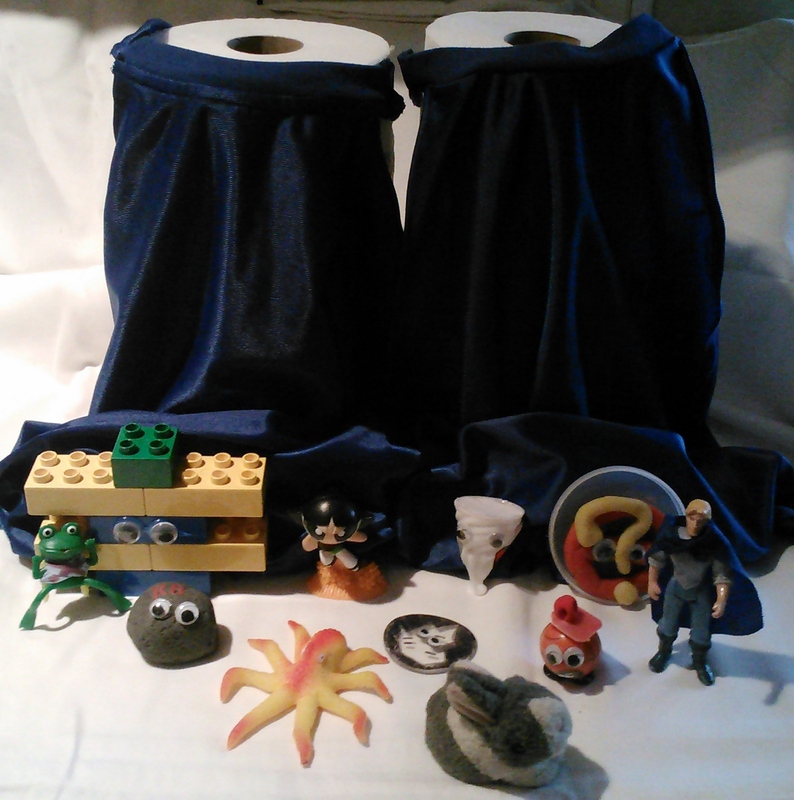 I have been busy gathering materials to make the characters and props. You don’t necessarily need a lot of props. However they are useful in grab bags or quick role playing in limited space. Many children respond better to manipulatives and props then paper and pencil activities. 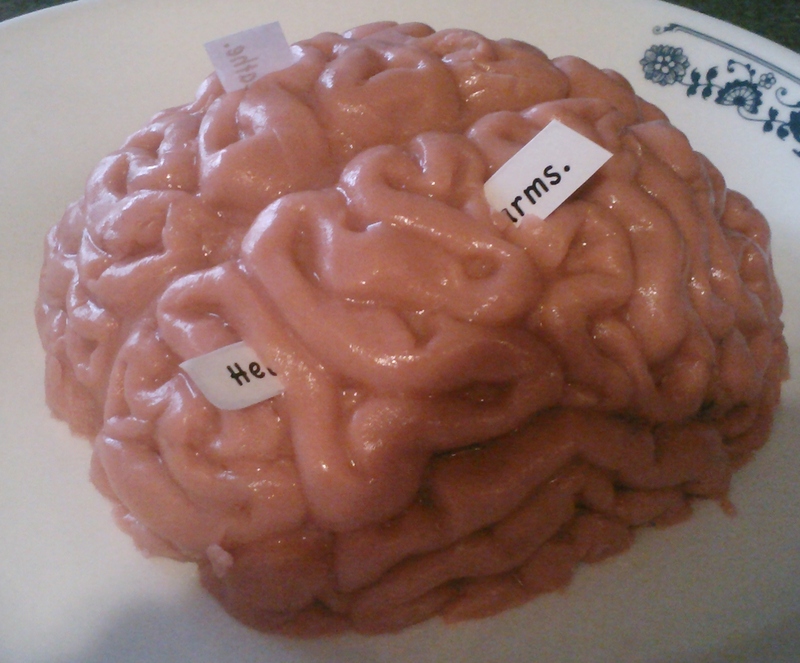 A model of a brain is helpful to simulate the brain sensor. I’ve found it helpful to visit craft stores and thrift stores that have small toys, fast food characters, and pieces of toys. I’ve learned that even if your children have grown you should never throw those things out. Here is what I have gathered so far. Can you guess the characters? Here is a quick way to make super hero capes. I found a large men’s short sleeve sport jersey in royal blue at the thrift store for fifty cents. I cut off the sleeves and came up to the neck and kept the neck band. The front and back gave me two capes. I cut off the lower cuff area on the sleeves. I then cut this circle and sewed each end to the neck band ends still attached to the cape. It was stretchy enough it could fit over a child’s head and I didn’t need to put on fastners. I did some hemming up the sides of the cape. This may not be necessary since it might be material that doesn’t fray. I’ve been looking for more team challenges. I never seem to have enough when working with my social pragmatic groups. I came across a site named “Great Solutions to Team Challenges”. It has a variety of challenges posted and I think I will try some of these next school year. I put the site on the blog roll so I would have an easy time finding it. I’m also connecting it here in case you would like to try some of them. Just click on the title.